.. and never want to go again"
Yesterday was an emotional one. It was E's last day at nursery before she starts big school in September and it isn't something she is looking forward to. E doesn't like change. It makes her anxious, she complains of tummy aches and it takes a while for her to adjust to anything new. When her key workers have changed at nursery it has taken her a while to get used to it and to get settled again So we've been discussing big school with her for months now. We've been telling her how she will be going with all her friends and what an exciting time she'll have, how much she'll learn and what she'll do. We've been reading stories about starting school, watching the Topsy and Tim episode and showing her the school on their website. We've brought some of her school uniform and she's helped to pick things and try them on and she's chosen her new lunch bag. When she's got upset and told us that she doesn't want to go to big school we've listened to her and told her that we understand she doesn't want to but we all have to and that we think she'll like it when she goes and not to worry about it until closer to the time. Last week saw her having her taster sessions. I started preparing her for it the weekend before and she had swung between excitement and not wanting to go. The first morning didn't start well, with complaints about breakfast and stomach ache but we got ready and dropped T off at nursery before we made our way there. She was very clingy before she went in and cried before being guided in by the teaching assistant. When she came out she said that she had enjoyed herself but was very quiet, until we got in the car and she said to me ' I hate big school Mummy and never want to go again'. She wouldn't go into any detail but spent a good hour and a half that night crying about having to go and telling me that she didn't want to, that no one would play with her and she didn't like it. The following day saw the four of us go to a teddy bear's picnic. It was less stressful and less formal but there was obviously a lot of people there as it included all the new starters as well as the rest of the school but it was really nice. It took E a while to warm up to everyone but she was OK with it. There was another taster session which she was not happy about and clung to me as they tried to guide her into the classroom. I made a reasonably swift exit after giving her a kiss and telling her I would be back soon and leaving her with the teachers. I watched from the fence where she couldn't see me and felt heartbroken as she looks so small - she's one of the smallest (and youngest) - and she was sobbing on the teacher's lap. We also had a story time session where all the parents went in with the children for stories and nursery rhymes. Again, she started off clingy sitting with me but by the end of the session she was sat next to the teacher, answering questions and pointing things out in the story. There was also a mass exodus to the toilets, so she knows what to expect there! E's birthday is towards the end of August meaning that she will have just turned four when she starts school. 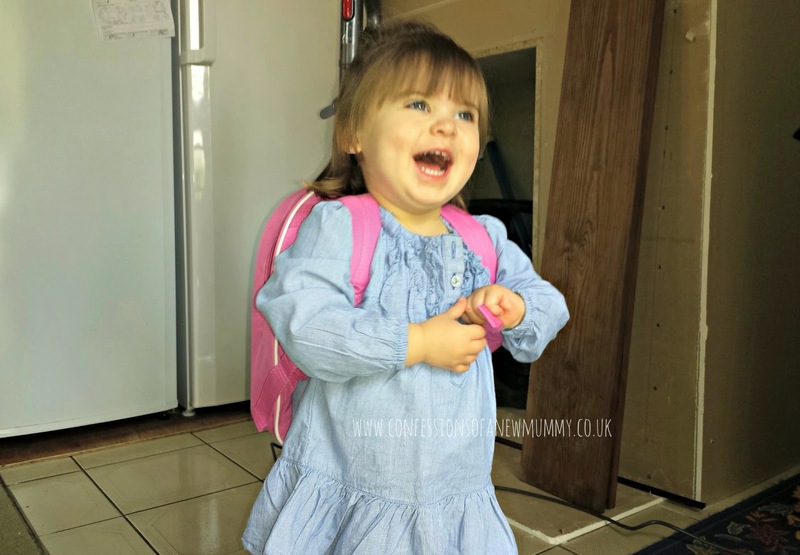 Whilst we could have kept her back a year we felt that she is ready for school, as did the nursery. She's bright and there's something like 15 of them from the nursery just in her class alone so she has lots of friends there with her. Not only that but many of them are also aware that she's shy and ask her if she's ok. The biggest issue is she doesn't like change and unfortunately I can't do anything about her having to go to school. Do you have any tips for helping with the transition to big school? I'd love to hear from you.